At Apartment List, we know that people care about a lot of factors when they’re searching for a home. Everyone wants a great apartment at a great price, but families look for different things in a city than young singles. Last year, we released our list of the best cities for young families; this year, we refreshed our analysis with the latest and greatest data to help you make the best decision for your homebuyers. This report is specifically tailored for Miami. Safety (35 percent): We used FBI data to rank cities by the number of violent crimes and property crimes per 100,000 residents. Housing cost (30 percent): We used census data to calculate the percentage of the median renter income required to rent a 2-bedroom apartment. School quality (25 percent): Cities were ranked on high school graduation rate for public school districts based in that city. Comparing schools across different states can be challenging, but using high school graduation rate data from the Department of Education gives us a good estimate of overall school quality. Child friendliness (10 percent): Communities with a greater percentage of children tend to be more child friendly, so we used census data to score cities based on the percentage of the population that’s under 18. We weighted these factors using the percentages listed above, and used this index to assign grades and rankings to the nearly 500 cities in our study. Miami’s highest score was its child score, with 24 percent of its population being under the age of 18. Next highest was its education score, with a graduation rate of 77 percent. Scores dropped off steeply from there, for crime and housing. About 5,892 crimes are committed per 100,000 people in Miami, and the average renter is cost-burdened, with the rent for a two-bedroom apartment requiring 44 percent of median renter income. 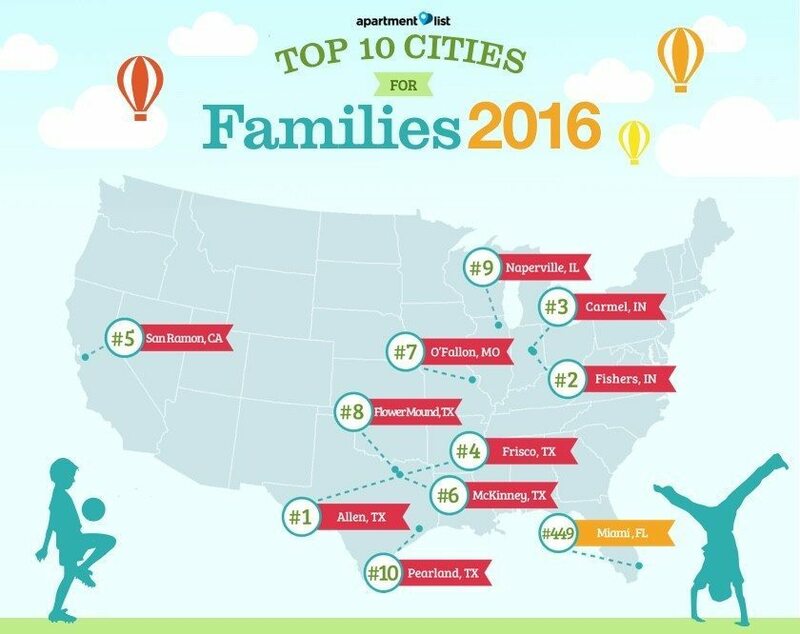 Overall, Miami is not the best city for a family.